Ancheer electric bikes are very popular among those that are looking for an affordable electric ride. This distributor of high quality health and fitness products, headquartered in LA, has managed to stand out with their lineup of electric bicycles, mostly thanks to the competitive pricing. But are Ancheer bikes worth the investment? Reviews are mixed; while some love Ancheer’s price range and do not mind some flaws, others complain about cheap construction and parts breaking. But the general agreement is that Ancheer electric bikes are well worth the price. There are people whose bikes have over 1000 miles on them, so that single fact should tell you more than anything else about how useful these e-bikes are. If you are thinking about purchasing an affordable, entry-level electric bike, take some time to read our short reviews of all the models from Ancheer line of products. We are sure it will help you make an informed decision and buy exactly what fits your needs, lifestyle and budget. Power Plus is the most popular model of the brand. The battery is a 36V. 8.8Ah, which will give you a range of roughly 18 miles on average, but it of course depends on various circumstances. The 250W high speed brushless gear motor will get you to 18mph if you use the throttle only, and with pedaling you can get to 20-22mph. It has two working modes – throttle only and Pedal Assist, and the PAS mode has three speed modes: low, medium and high. Front suspension is just enough to make your ride more comfortable over bumps and pot holes, and knowing that the front suspension is not that common in electric bikes, let alone the lower priced ones, this is a huge plus for this bike. It’s got an impressive set of features, such as front and rear brake discs, very bright front LED headlight. The brakes are really good, just be aware that they might not be perfectly set up out-of-the-box, and they might need some adjustment. That shouldn’t be a problem, considering they are mechanical disc brakes. Little display gauge with 5 LEDs that is supposed to show you how much battery you have left is, in lack of a better word, useless. It is not reliable at all, and you will have to keep track of the battery charge level yourself. You will also need to make sure that the front fork is mounted the right way, because the bike supposedly arrives with the front fork mounted backwards, so it can fit in the shipping box. So if you are assembling the bike yourself you will need to correct this. If you can, we recommend you opt for the full-assembly option on Amazon. The fee is small, and you get a road-ready bike the moment you open the package. This is a very attractive option for those that plan to use it for commuting and saving money on gas. And if you are willing to spend a little bit of time and just a little more money on sorting out a few issues that might come up, you will get a lot of miles out of Power Plus Electric Mountain Bike. UPDATE: We are super excited to announce that there is a brand new Ancheer electric mountain bike on the market! The latest 2018 model has more powerful 350W motor, 10.4 Ah LG Li-on battery, Shimano 24-Speed gear and extended range of 30 miles per single charge. Instead of 26” wheels, this bike is now equipped with 27.5” tires that deliver more confidence, traction, and stability. Also a new LCD display, rather than the old LED one, has more functions and instead of 3 speed modes, there is now 5. And you still get all the good stuff from the previous models, disc brakes, removable battery, but there is no headlight. This bike is UNDER $1000, and is currently ON SALE, so be quick to get this really great bike for a really great price. If you need longer range, this is the bike for you. It is basically the upgraded version of Power Plus Mountain E-Bike, featuring a large capacity battery for going longer distance. It has got the same set of features, including the 21-speed transmission system, bright LED headlamp and horn, front and rear disc brakes. The 36V lithium battery has the capacity of 12Ah, which will allow you to go up to 24 miles if you only use the throttle, and if you ride in Pedal-Assist mode, even more. The battery is removable, so it can be charged independently, and sleek design makes it almost unnoticeable. This is the improved model of the Power Plus and the only thing that is missing is a more powerful motor. Overall it is a good, well performing bike. If you believe that biking season should last whole year round, you need a bike that you can ride both on the sandy beaches and snowy mountain trails. That is what fatbikes are all about, so at Ancheer they made sure to include one into their product line. Equipped with 26*4.0 CST Fat Tire, it can be ridden on different kinds of road, snow, beach, dirt trails. With the help of a powerful 300W motor you’ll places you never thought you’d never be able to pedal a bike reaching the top speed of about 16 mph. The 36V-10AH lithium battery allows the bike to travel up to approximately 17-23 miles, from a single 4-6 hours charge. This bike is jam-packed with useful features for safe and comfortable ride: LED headlight, adjustable seat, fenders, kickstand that is positioned much better than on some other models, Shimano Tourney 6 Speed Gears for smooth shifting and more. Just like on previous ones, battery is removable, which allows you to easily charge it up without having to move the whole bike near a wall socket. Despite the fat tires, this bike is not a true off-road ride. Handlebar and front fork design will not perform o perform as well as a standard mountain bike on more advanced and treacherous paths. But if you want a bike to ride around the beach, without breaking a sweat, you will have lots of fun on this one. You need a fat tire electric beach cruiser? This bike is probably the best that you can get for the money, especially if you can get it on a discount. It does exactly what it should: it provides fun and exercise (if you want it to) whether on the beach or in the drifts. Ancheer City E-bike is designed for urban commutes. Equipped with a lightweight steel frame and a 250W brushless gear motor that will provide assistance to climb hills with ease and provides a burst of speed when you need to pull away from traffic lights. 36V, 10Ah battery, needs a 4-hour charge to allow you to travel to 17-23 miles. The bike comes with a rear cargo rack that can accommodate your commuter bag, which is important. With Shimano Tourney 6 Speed Gears it rides smooth, shifts easily and has a solid motor is not hard to figure out in a hurry. The bike is very affordable, it is one of the cheapest electric bicycles that provides full bike riding experience. And features like a front and back disc brakes, headlight and horn. A suspension fork provides a smooth ride. Battery is integrated into the bike, which means you have to charge it on the bike. However, this also means that the battery and whole electric assistance system is pretty well concealed, and you really have to take a hard long look to notice that the bike is electric. If you ignore a red “City E-Bike” decal on the frame. Tires are not the best quality, so it might be a good idea to invest in getting a set of new, quality commuter tires. Considering that this is a commuter bike, it feels a bit heavy. The steel frame, battery and motor put it around 55lbs, which might be a bit heavy to lug around, especially when you add bags for carrying your stuff. Not very convenient to carry up and down the stairs. If you’re lugging a heavy load on your daily commute or just have a lot of groceries, the Ancheer City E-Bike will be your new best friend. Most importantly, with this electric bicycle there are no more sweat-fueled power sessions every time there is an incline. Collapsible lightweight aluminum frame is designed quick folding and easy storage so you can easily cram the bike into a small storage space. This lightweight urban e-bike rolls on 20-inch wheels and features a 7-speed Shimano drivetrain. 250W high speed brushless gear motors gives you the top speed of 15mph in throttle mode, and in pedal assist mode once you start pedaling, the motor will catch on about 5 to 10 mph and get you going up to about a good 20 mph. 36V 8Ah battery charges fairly quickly 3-4 hours is enough for few short trips to the store or take you up to 30 miles with pedal assist. You have already figured out by now that all Ancheer bikes are jam packed with useful features. This one also has front and rear disc brakes, LED headlight and a horn and a nifty rear rack. Both the seat and handlebar are adjustable, so the bike fits every rider, whether you are 6’2” or 5’1”Everything is tucked away in the frame, so no exposed battery, and no risk of damaging it when folding the bike. You can even drive it in the rain, because all the parts are waterproof, just don’t drive it into a lake. High-strength steel front fork with premium comfort shock absorption provides comfort on the ride, but seat is not as comfortable as you might hope. Folding is quick and easy, and thanks to its compact dimensions it will fit nicely in the truck of your car. However, it might not be so convenient if you have to pick it up and carry it with you, because it weighs about 60 pounds. But the fact that it is fast and fun to ride, and also compact and cheap, make it a very interesting model for commuters. There is a new 2018 version of this bike, with some improvements like aluminum alloy double-walled 6 spokes rims, improved front and added rear suspension. It cost about $200 more than a previous mode but if you order it now on Amazon, you can get it for the price of previous model. What’s better than a powerful, affordable electric mountain bike? A powerful, affordable electric mountain bike that folds and is lightweight enough so you can toss it in your trunk and take it to an adventure. Lightweight frame is made of anti-rust aluminum, and super lightweight 26” wheels are made from very strong magnesium alloy and are equipped with anti-slip resistant thick tire that can go across any terrain. 36V, 8Ah Lithium battery is tucked in the little pouch on the front of the bike, not on the frame like on other models. The range you can go on a full charge is about 31 miles in Pedal Assist mode, and a 250W motor enables this bike to get to the top speed of 15.5 mph. It’s got two working modes E-bike mode for cruising around by twisting the throttle, and Assisted if you still want to get some exercise. LED front light and horn are included and it has got shock suspension on the front and on the back, which makes the ride smooth over bumpy ground. Mechanical front and rear disc-brake provide safety and 21-speed Shimano professional transmission system provides a decent climbing ability. This bike is designed to be lightweight, folding and durable, intended as a perfect option for short commutes. 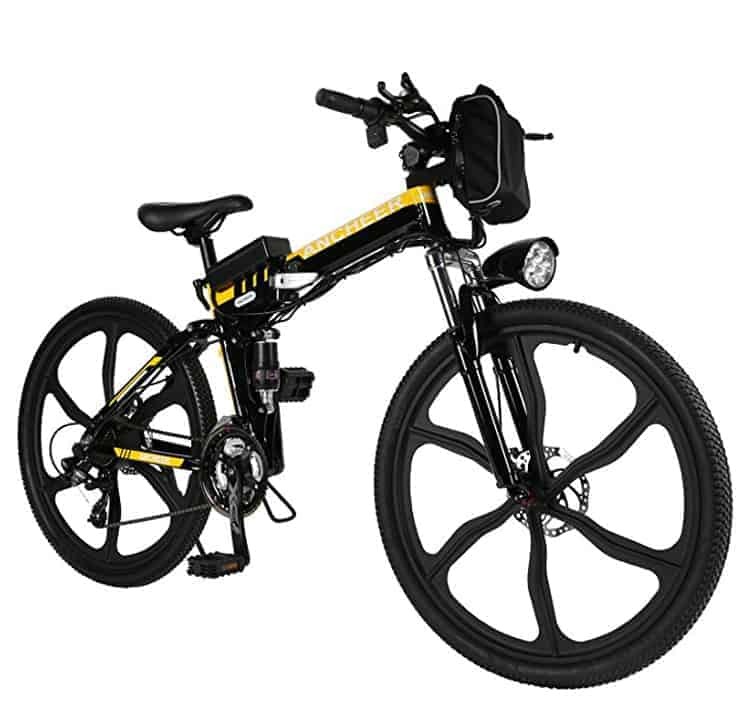 Relatively powerful 250W geared motor combined with a 36V 6Ah Lithium battery can travel up to 15.5 MPH up to 11miles in E-Bike mode or 15 miles in the Assisted mode. Front and rear wheels are equipped with disc brakes, which is a rear feature on a small-wheeled folding model. If you are not a pro rider and you just need something that is easy and fun to ride, this little cheap electric bike is the perfect option. It is very easy to set up and awesome in handling. It looks cool and you will want to take it with you everywhere you go. And you probably can! This is the most unusual looking of all Ancheer electric bikes. To be honest, it doesn’t really look like a bike, more like a tiny portable electric scooter. This little electric bike offers an innovative approach to transport in traffic-clogged cities. Weighing in at just 26 pounds with an aluminum alloy frame, you can carry it with one hand! It pairs up a 350 W brush-less motor with a 36 V battery for a top speed of 12 mph and up to 12 miles range. With its own app and numerous smart functions, is billed as safe and practical for commuting use. The handlebars fold down for compact storage, making this a great e-bike for those living in condos, and due to its tiny size, you can throw it in the trunk and take it along on your travels. Integrated front and rear lights are included and thanks to the IPX5 Waterproof range you can ride even on rainy days. If you’re looking for a cheap, light and fun bike to get you around locally and you don’t have to encounter too many hills this bike is great. To wrap it up: Ancheer has got a bike for every rider, from adventurous mountain bikers to busy college students looking for way to get around campus. They are certainly not on par the best, high-tech electric bicycles with all the gadgets and gizmos, but neither is the price. If you are looking for affordable, entry level electric ride you can find an Ancheer for you – rigid or folding, for dirt trails, sandy beaches or tarmac, big or small. The beauty of Ancheer bikes is that they are affordable enough, so you will have couple of bucks to spare on little tweaks and customizations that will make the bike your own.